The move comes after the company helped cause an ongoing drug overdose crisis that has killed hundreds of thousands. The drugmaker at the center of America's opioid crisis is halting one of the practices that helped cause an epidemic of addiction and death. Last week, OxyContin maker Purdue Pharma announced it will stop marketing its painkillers to doctors. According to Bloomberg, the company told its employees that it will eliminate half of its sales force and send a letter to doctors this week telling them that salespeople will no longer go to clinics to talk about their opioid products. "We have restructured and significantly reduced our commercial operation and will no longer be promoting opioids to prescribers," Purdue said in a statement. The beginning of the opioid crisis can be traced back to the release of OxyContin, which is Purdue's best-selling drug. After its release in 1996, Purdue carried out an aggressive marketing campaign that described OxyContin as both safe and effective - misleading doctors into thinking the pills could be prescribed with minimal problems. Purdue's decision to stop marketing OxyContin comes at a convenient time for the company. Purdue, along with other opioid companies, has over the past several years faced an increasing number of lawsuits from cities, counties, and states blaming the drug manufacturers for irresponsibly fostering the current overdose crisis. At the same time, the company's profits from OxyContin, as well as opioid prescriptions in general, have recently dropped - OxyContin generated $1.8 billion in 2017, down from $2.8 billion in 2012, Bloomberg reported. So Purdue perhaps saw the writing on the wall - after two decades of an overdose crisis that it helped cause. Purdue was a driving force in America's opioid epidemic, marketing its product as a safe and effective way to treat pain - claims that proved to be misleading and even deadly. Between 1996 and 2002, Purdue Pharma funded more than 20,000 pain-related educational programs through direct sponsorship or financial grants and launched a multifaceted campaign to encourage long-term use of [opioid painkillers] for chronic non-cancer pain. As part of this campaign, Purdue provided financial support to the American Pain Society, the American Academy of Pain Medicine, the Federation of State Medical Boards, the Joint Commission, pain patient groups, and other organizations. In turn, these groups all advocated for more aggressive identification and treatment of pain, especially use of [opioid painkillers]. The marketing focused largely on telling doctors that they suffered from what opioid companies described as "opiophobia," the idea that physicians were too reluctant to prescribe opioids due to supposedly outdated notions about the drugs. Purdue led much of the marketing effort, but campaigns were also carried out by other drug companies like Endo, Teva, and Abbott Laboratories. 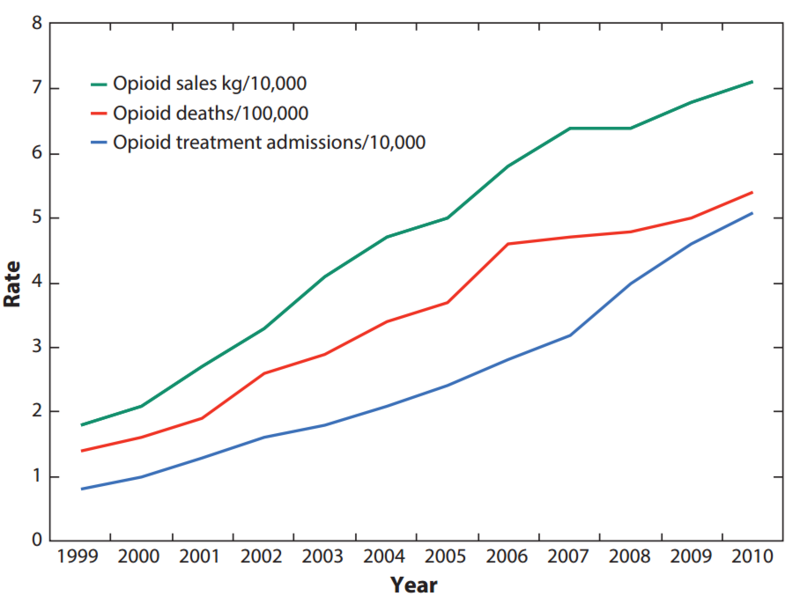 As the opioid crisis has demonstrated, doctors' initial resistance to opioids was well warranted: Opioids are, indeed, very addictive and dangerous. Yet the marketing proved profitable for Purdue and others - as opioid misuse and overdoses grew, so did profits from the drugs. It's not just that the drugs were deadly. They also weren't anywhere as effective as Purdue and others claimed. There's simply no good scientific evidence that opioid painkillers can effectively treat long-term chronic pain as patients grow tolerant of opioids' effects - but there's plenty of evidence that prolonged use can result in very bad complications, including a higher risk of addiction, overdose, and death. In short, the risks outweigh the benefits for most chronic pain patients. OxyContin in particular seemed to have specific problems. As an extensive Los Angeles Times investigation found, Purdue marketed OxyContin for its supposed ability to provide 12 hours of pain relief. But as Harriet Ryan, Lisa Girion, and Scott Glover reported, "Even before OxyContin went on the market, clinical trials showed many patients weren't getting 12 hours of relief. Since the drug's debut in 1996, the company has been confronted with additional evidence, including complaints from doctors, reports from its own sales reps and independent research." This was critical to Purdue's competitive advantage: If it really didn't provide 12-hour relief, then it wasn't more effective than other similar painkillers on the market. In the face of the evidence, though, Purdue stood by its claim for years. And it told doctors that if patients weren't seeing the promised results, then the problem was that doses were too low. These efforts, it seems, were in the name of profit. One sales memo uncovered by the Times was literally titled "$$$$$$$$$$$$$ It's Bonus Time in the Neighborhood!" This is alarming for public health: As the Centers for Disease Control and Prevention (CDC) warned, higher doses and longer use of opioids increase the risks of the drugs. Yet Purdue encouraged such practices, despite a lack of evidence for effectiveness, for profit. In 2007, Purdue Pharma and three of its top executives paid more than $630 million in federal fines for their misleading marketing. The three executives were also criminally convicted, each sentenced to three years of probation and 400 hours of community service. In lawsuits filed by cities, counties, and states, officials have argued that Purdue and other opioid companies continued their misleading marketing after Purdue paid federal fines. It wasn't until 2011 that overdose deaths linked to common opioid painkillers began to level off - and the deaths have remained elevated, at well above 10,000, since then. Until 2015, commonly prescribed opioid painkillers were the No. 1 cause of drug overdose deaths in America. Purdue's pullback from opioid marketing, at this point, simply comes too late. America is hundreds of thousands of deaths into its opioid crisis, and there aren't any signs that the crisis is slowing down - with preliminary data suggesting that 2017 was even worse than 2016 for overdose deaths. The damage is done, and the crisis is now ingrained. But it's a convenient time for Purdue to pull out. As Bloomberg noted, OxyContin profits have dropped over the past few years. This seems to be part of a broader national trend: According to the CDC, opioid painkiller prescriptions have fallen since 2010 - although in 2015, the amount of opioids prescribed per person was more than triple what it was in 1999. So Purdue's marketing efforts didn't seem to be paying off anymore as awareness of the current epidemic spread. Purdue is also among the opioid companies now facing up to hundreds of lawsuits due to their involvement in the current crisis. These lawsuits, filed by several levels of government, are not just an attempt at getting vengeance on these drugmakers for what they did; the litigants hope they can get a lofty settlement that will come with money to pay for a lot more addiction treatment and place restrictions on marketing that could help prevent future drug crises and slow down the current one. There's a precedent for this: In 1998, tobacco companies signed the Master Settlement Agreement with 46 states - forcing the companies to pay tens of billions of dollars and putting restrictions on the marketing of tobacco products. But there are big differences between opioid and tobacco companies; for one, opioids were approved and regulated by the Food and Drug Administration (while tobacco products weren't at the time of the Master Settlement) and prescribed by doctors, so some of the blame for the opioid crisis falls on government regulators and doctors in a way it did not for the tobacco epidemic. Still, the legal threats seem serious: In Cleveland, a federal judge has now convened talks between governments around the country and drug companies to try to come up with a settlement that all parties can agree to. It's in the context of reduced revenue and mounting legal threats that Purdue has pulled back its marketing of opioids. So while the move is being welcomed by activists and public health experts, it's also self-serving in that it may protect the money Purdue has already made from OxyContin by potentially making the company look a little more responsible and forward-looking to the courts.